Something about this cheerful wedding just puts a smile on our faces in the midst of this cold winter weather! We had the pleasure of working with Dan Padavic of Vahalla Studios fame (a full service design studio and print shop – run by Dan and Tad Carpenter – located in Kansas City) on our most recent addition to our shop, (the screen printed Ampersand Series). That's when we spotted Dan's perfectly designed wedding invitations and a few of the fun collateral pieces – all laid out in neat little stacks in a metal flat file drawer in his studio. The simple design, with a vintage twist, the family illustrations (including the dogs, of course), and the tactile feel of the paper and the imprint – no detail was left untouched! So, needless to say, we were happy to stumble upon these gorgeous images from the big day, taken by none other than Eric & Neal of LemonLime Photography, on the Vahalla Studio blog! These photos just put all the rest of the pieces together in our minds! Such a happy, perfect couple — congrats guys and thanks for sharing the photos! If you have fallen in love with this wedding as much as we did, don't hesitate to ask Vahalla to design elements of your very own wedding! It's no secret that we love the ampersand (eh-hem, our business name). It's just the one simple symbol that can mean as much or as little as you want it to! With one single stroke, the ampersand is the mark that connects two separate elements. We both have a strong love of typography, so, we were excited to discover that the ampersand is also historically the character that a typographer can use to infuse a little more personality and playfulness into a font. Simply put, it's the character that gets to have a little more fun! What's not to love about that?! Don't worry fellow-lovers-of-the-ampersand, we're not trying to claim ownership of the "and" symbol, by any means. 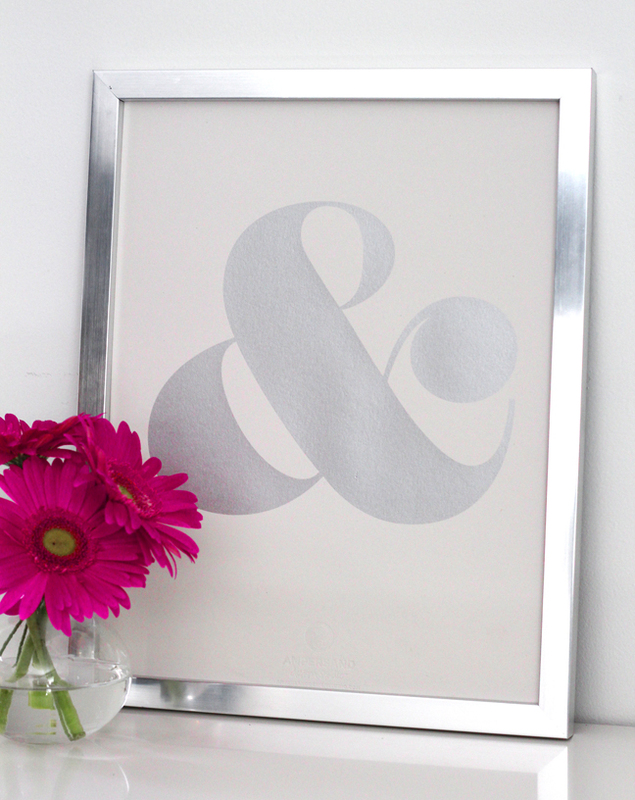 We just love it in all it's different forms, so this is our little tribute to the ampersand! So, today we are SO EXCITED to announce the official launch of our new Ampersand Signature Series!! We did have a few of our new items on the shop a couple of weeks ago, so if you visited then, you might've gotten a little sneak peek, but now the full Ampersand Signature Series line is live and here is a little rundown of what you can find! We've poured our hearts into these so we really hope you love them! These limited edition 11" x 14" prints include ampersands in neon pink, neon yellow, gold or silver on chipboard or pale gray heavy weight paper. We are just obsessed with the way the colors pop off the neutral backgrounds! Each print also has an emboss of our logo and will be numbered in pencil at the bottom right hand corner. We teamed up with the brilliant Vahalla Studios for the screen printing and embossing of this series. Total dream team! We absolutely loved partnering with them! These truly are limited edition, we just have 50 of each colorway—so you better scoop these up fast! We love seeing type and letter forms in the classic color palette of black and white—especially when they are over-sized to accentuate the positive and negative shapes! So, we are also offering 8"x 10" and 11" x 14" black and white prints. We have the singular ampersand art print but, being pattern designers at heart, we couldn't go without doing an all over surface pattern, as well! There are just SO many beautiful ampersands from various fonts that we had to give a few more of them a home. Each one in this series is printed on 100% cotton velvet fine art paper in archival pigment inks. They are so beautiful in person! Platters — can you ever really have too many?! We think not. We are constantly using platters for entertaining and serving, but we we also can't get enough of them for decorating and displaying! So we decided to design a couple of platters that we just really wanted to own. ha! (They look particularly good together, too). But really, how perfect to serve cheese & crackers! Or to display your favorite collections? We envision the silver ampersand print as a perfect engagement gift...The neon ampersands tacked up in a creative office space... The black & white print as a perfect photo prop for two besties or future husband & wife...the platters holding your collection of photobooth strips of family & friends...! We'd love to hear how you can imagine using them! So go check out the full new line and all the other fun goodies in the shop, too!